Lofty promises such as firmer, more radiant, and younger-looking skin are irresistible. After all, who wouldn't want to fork over the cash for a bottle of cream if it promises to make your skin look more beautiful and turn back the hands of time? Skin care and cosmetic companies have a way of making everything seem so simple. Simply slathering on a cream that makes you look younger does sound divine, but the truth - or lies - are in the bottle. Does a Miracle in a Bottle Exist? While there are some proven ingredients that can improve skin's texture and quality, tightening the skin is a bit more complicated than simply applying a cream. However, this doesn't make marketing claims that promise to lift and tighten skin any less irresistible, especially when coupled with before and after photos that appear too good to be true. Although it may seem disappointing to hear, there is no tightening cream or any other type of cream that can produce the same king of results as a cosmetic surgery. In other words, no tightening cream in the world will work as efficiently as a laser or face lift. Skin care company Paula's Choice writes on their website that there are absolutely no firming creams that will give you a result similar to what you'll find at a dermatologist or cosmetic surgeon's office, and this includes injectable fillers. First, it's important to understand the components of firm, tight skin. Supportive fibers in the skin, known as elastin, provide skin with an ability to remain flexible and bounce back when pressed. Elastin is produced in the skin when a baby is in the womb and throughout childhood, but as a person gets older, the production of elastic slows and then comes to a complete halt as a person reaches older adulthood. Elastin is something that cannot be reproduced within the skin, even in the realm of high technology skin care procedures that exist today. Damaged, broken down elastin may result in sagging skin. When skin starts to sag due to the normal aging process, and you throw in sun damage, the skin may take on the look of crepe paper. While browsing through any average skin care aisle at your local drugstore, you may notice that many skin care products that are marketed as being able to tighten or firm the skin may contain collagen or elastin as part of their formulation. This may sound promising, since these two elements of the skin are very important for giving it the healthy, radiant look of youthful skin. However, according to the Paula's Choice website, the molecules of these two ingredients are too big to penetrate the skin and make any difference. They will basically sit on the surface of the skin with nowhere to go. Even if these molecules were small enough to be absorbed into your skin, it would be impossible for them to merge with your own skin cells to create any type of difference within your skin. Protecting skin from the sun will help prevent more sun damage and sagging. Even when indoors, the rays of the sun can still shine through windows and have a potentially negative effect on skin. For this reason, it's important to wear sunscreen when you're inside as well as when you are outdoors. 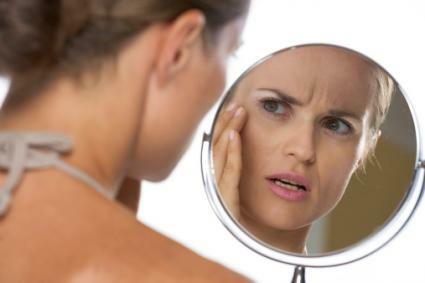 While it is unlikely that a cream will actually produce a lifting effect, even a basic moisturizer can temporarily make wrinkles appear less deep. Applying a moisturizer with antioxidants will also help improve skin laxity and texture because antioxidants help combat free radicals which are found in air pollution and stress chemicals released within the body. Vitamin C is a highly stable and beneficial antioxidant for skin care. It also comes in the form of l-ascorbic acid in skin care products because this form of vitamin C has proven stable and combats oxidative stress. WebMD points out that in addition to applying a basic moisturizer, you may want to consider using a retinol product, which can be purchased over the counter in any drugstore or pharmacy. A doctor can also prescribe a more potent form of retinol, known as a retinoid. Retinols and retinoids are forms of vitamin A in high percentages, and they encourage skin cells to turn over and produce new skin cells, which helps skin look fresher and renewed. A study conducted by TS Alster and E Tanzi for Dermatol Surg, as published on PubMed, indicates that one promising way to improve facial skin tightness is via a nonablative radiofrequency device. The study looked at the nonablative radiofrequency device's results on fifty patients who all had signs of mild to moderate laxity on their cheeks and necks. Photos were observed by people who judged the improvement of the subjects' skin periodically up to six months after the procedure, and it was determined that the subjects experienced improvement. The downside to these treatments is that its lasting power is not yet known, so it is possible that maintenance treatments may be necessary to keep facial skin tight. If you are seeking a way to tighten your skin, the answer is not in a bottle. Cosmetic surgery is the only option that will truly result in tighter skin. However, following the suggestions discussed here can help improve the overall condition and appearance of your skin, as well as prevent future damage.